The Manhattan House restaurant in Manhattan Beach has slowly been picking up momentum since opening in July 2015 thanks to the sterling work of chef Diana Stavaridis. She is a former protégé of Neal Fraser, and although the place likes to bill itself as New York meets Manhattan Beach, there are plenty of other influences on tap here like North African and Southern style cooking. 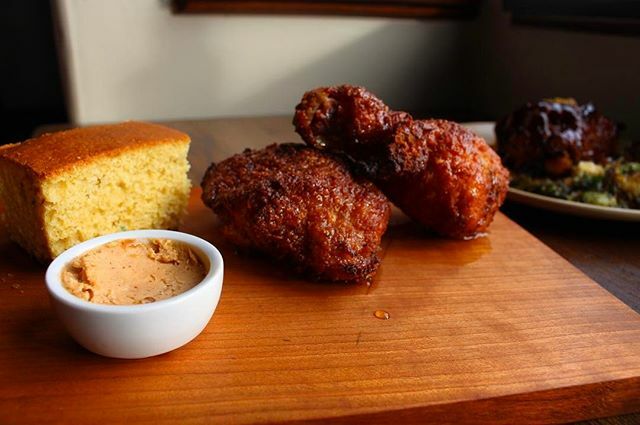 Nothing emphasizes that better than the sumptuous Fried Chicken ($18), which is buttermilk fried and served with corn bread and chile honey butter. Almost all of the plates are perfect for sharing, prices are reasonable enough and the service is brisk and attentive. Everyone involved is proud that they are a garden to table restaurant with most of the ingredients coming from a local community garden. The hard working staff also spend a lot of time baking, brining, fermenting, curing and roasting to ensure that the end product comes out as fresh as possible. However before that, I can vouch strongly for the Carrotology v. 2.0 ($12), yes a plate full of carrots prepared twelve different ways in a very savory manner that was of course extremely healthy. Another specialty of the house well worth checking out is the Wild Mushroom Toast ($16) with Shiitake Happens Mushrooms with caleggio, all tastefully served on a house prepared Sourdough. One of the other house specialties is the North African themed Grilled Lamb Meatballs ($15), which are nice and spicy Sonoma lamb balls with buckwheat tabbouleh, baby radish pickles and a spicy yoghurt cheese. Lovers of Foie Gras can get their fix with the Foie Gras Royal ($13), which was served with a strawberry compote on brioche toast. The pan roasted local fish in this case turned out to be halibut in a bouillabaisse mix of clams in a saffron tomato broth along with yukon potatoes and a herb salad ($27). The drink menu is surprisingly quite comprehensive with an emphasis on House Manhattans and nine specialty cocktails. I tried the Thriller with Reposado Tequila, kumquat, Serrano chili, lime and served on the rocks. My companion tried a couple of the House Manhattans, although we could just have easily stuck with the impressive beer selection or the even more impressive wine list. The selection of French high end reds with prices to match indicate that despite the casual beach atmosphere and relaxed dress code, this is a restaurant with quite serious aspirations. The rather funky and graffiti based exterior, also belies what is going on inside the walls. They offer Weekend Brunch on Saturday and Sunday from 10am-2pm that feature dishes not on the regular menu. Those that sound interesting include the Shakshuka, a Tunisian inspired concoction of eggs poached in a sauce of saffron fried tomatoes and a Short Rib Pastrami Hash with cage-free eggs. No free flowing champagne or bottomless Mimosa’s at this point, but they do offer one complimentary cocktail with the purchase of one main course. Hours-Open 5pm till late-closed Mondays.